Imperium space marine scouts meet the Tyranid hive fleet in the depths of space. 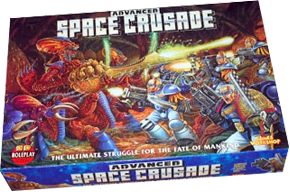 A sadly forgotten ‘big box’ game by Games Workshop, set in the Warhammer 40,000 universe aboard a bio-organic ship of the alien Tyranids. It’s quite complex, but the game is a satisfying and amospheric miniatures combat system. This comprehensive reference pack includes everything you need, including force roster cards, to play the game as smoothly as possible. I’m getting an error when trying to view the PDF? Well, we can’t have that! Link error fixed. Love your work and so glad that you’ve got something for this game. Hoping to get a few games in these holidays. Noticed that in White Dwarf 132 there is some errata that should be changed on your aid (happy to send a copy if needed). Also be great to fit in the stranger stats if possible. I’ve just got this game out of the loft after 20 years, I’m going to print off your excellent reference sheets and have been reading the rule book again ready for playing again, there’s something a can’t find in the manual and that is the range that grenades can be thrown? Any thoughts? As it says in my summary, grenades have a range of 8 squares. Thanks for this great PDF. I played again for the first time in years last night, and the squad cards were much better than the old roster sheet. I did notice that the Heavy Bolter on the Scout record didn’t list its Snap Fire stats though. Could this be updated if you have the time?! Thanks Chris, I’ll fix that asap. Thanks for fixing that. And in time for my next game!